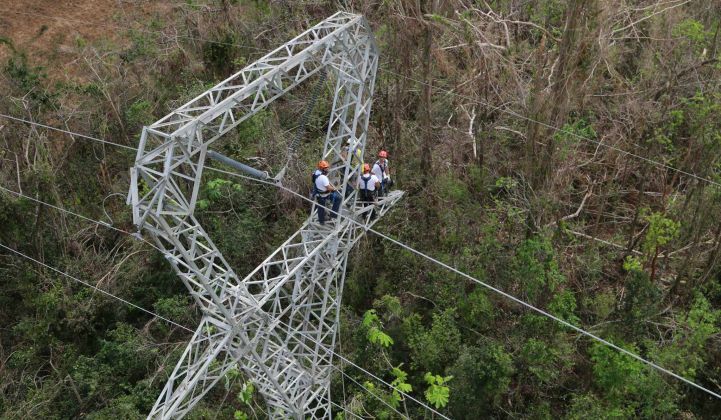 Governor Rosselló has requested that PREPA terminate Whitefish Energy’s controversial agreement immediately. Whitefish Energy workers repairing power lines in Puerto Rico will soon have their contract scrapped. The head of Puerto Rico's government-owned utility confirmed Sunday afternoon that he is moving to cancel a controversial contract awarded to Whitefish Energy, a small Montana firm hired to help rebuild the island's devastated power grid. Ricardo Ramos, CEO of Puerto Rico Electric Power Authority (PREPA), said he will ask the board of directors for a resolution to scrap the agreement at the request of Governor Ricardo Rosselló. Earlier on Sunday, Rosselló called for PREPA's governing board to "immediately" take steps to cancel Whitefish's $300 million contract -- the largest awarded for grid recovery to date -- amid growing criticism from Congress and the Federal Emergency Management Agency (FEMA). To make up for the labor that would have been provided by Whitefish, as well as the delayed arrival of the U.S. Army Corps of Engineers, the governor has requested a "mutual aid agreement" with the states of New York and Florida. “I am making this determination because it is in the best interest of the people of Puerto Rico,” Rosselló said at a news conference over the weekend. The cancellation request comes after a copy of the contract circulated on the internet last week, revealing a clause that the U.S. government is prohibited from reviewing Whitefish's profits related to its relief efforts. Rosselló thanked PREPA and its contracted companies for their efforts to restore power to Puerto Rico, roughly 75 percent of which is still in darkness a month after Hurricane Maria made landfall. The governor stressed there is currently no evidence of wrongdoing with respect to Whitefish, but added there can be "no distraction that alters the commitment to repair the power grid as quickly as possible." FEMA said in a statement on Friday that it had “significant concerns" with how PREPA procured the Whitefish contract and "has not confirmed whether the contract prices are reasonable." FEMA also denied any role in approving the deal, despite language in the contract that suggests otherwise. Ramos, who signed off on the deal, said the contract is "not canceled as of yet," and would require giving the company 30 days of prior notice. "The plan is not to demobilize them, either; we will let them finish what they have started," Ramos said during a press conference. Ramos defended the terms of the agreement, but acknowledged that it has sparked controversy. Whitefish recently requested security protection because island residents were throwing rocks and bottles at the repair crew, he said. With so much of the island still suffering through the blackout, Ramos said there is a sense the young company is to blame. Whitefish Energy, which reportedly had just two full-time employees at the time the contract was awarded, said in a statement that it is "disappointed" with the decision to terminate their agreement. "The decision will only delay what the people of Puerto Rico want and deserve -- to have the power restored quickly in the same manner their fellow citizens on the mainland experience after a natural disaster," the company said. "We will certainly finish any work that PREPA wants us to complete and stand by our commitments knowing that we made an important contribution to the restoration of the power grid since our arrival on the island on October 2." The company has been regularly sharing updates on its progress through social media. Ramos told reporters last week that PREPA chose Whitefish because it did not require a large upfront deposit, while the other contender wanted a $25 million down payment for the work. Given Puerto Rico is $74 billion in debt, "we were not in a position to offer that collateral," said Ramos. Nonetheless, many observers are skeptical of the deal, especially since the Montana firm happens to be from Interior Secretary Ryan Zinke's tiny hometown. Whitefish Energy also happens to be backed by a major Trump donor. Democrats in the House and Senate have called for an investigation into the circumstances surrounding the multimillion-dollar contract. Congressional Democrats have specifically asked the Interior Department's Inspector General to launch an investigation into whether or not Zinke played a role in setting up the Whitefish contract. Rosselló has also requested additional information. In a letter sent Wednesday, he asked the Department of Homeland Security's inspector general’s office to conduct an audit of how Whitefish Energy landed the contract. On Sunday, he said he will also designate a finance administrator to oversee PREPA's contracting to ensure transparency going forward. San Juan Mayor Carmen Yulín Cruz, an outspoken critic of the Whitefish deal, told MSNBC on Sunday that Rosselló must immediately “fire the person that signed the contract,” referring to PREPA CEO Ricardo Ramos. Meanwhile, Whitefish Energy CEO Andy Techmanski told NBC News that critics of the deal are on a "witch hunt looking for something that does not exist." He also refuted the often-reported stat that his company had only two employees at the time it signed the PREPA contract. Techmanski said the company had 20-40 full-time employees working on projects in Arizona, Montana and Washington state. Whitefish currently has more than 350 workers in Puerto Rico, and had plans to send several hundred more. Interior Secretary Ryan Zinke has been ensnared in the controversy because he and Techmanski both hail from the small town of Whitefish, Montana. Zinke issued a statement Friday afternoon acknowledging he knows Techmanski, but forcefully denied any involvement with the company's work in Puerto Rico. "I had absolutely nothing to do with Whitefish Energy receiving a contract in Puerto Rico. Any attempts by the dishonest media political operatives to tie me to awarding or influencing any contract involving Whitefish are completely baseless," he said. "Only in elitist Washington, D.C. would being from a small town be considered a crime," Zinke added. Critics of the Trump administration have latched on to the connection, despite the secretary's insistence he did not advocate for Whitefish in any way. Sierra Club Executive Director Michael Brune said the administration's failure to answer questions about the Whitefish controversy "proves that they want everyone to look the other way at this shady contract precisely because the Whitefish contract appears to be the latest example of Trump and Ryan Zinke pulling strings to enrich their friends," he said in a statement Friday. Zinke said that he welcomes "any and all investigations into these allegations."